Today is what is traditionally regarded as Epiphany, its the 12th day of Christmas, the day the three wise men visited Jesus, the day to take down your Christmas decorations and the day to sadly end the festive season. And in honour of such a sad day I baked a cake, or rather a Galette Des Rois, which indulges my current loves of all things almondy and cakey. 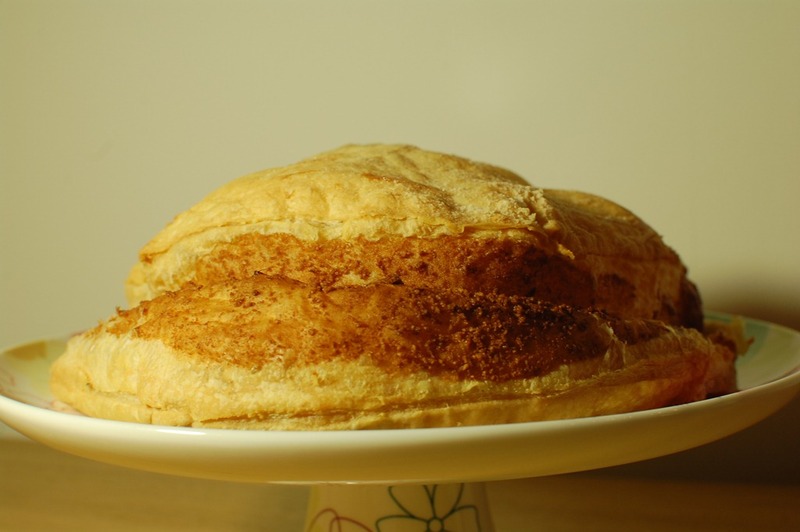 Galette Des Rois is a French dessert that is served on the twelfth night. Many other countries have different ‘Kings Cakes’ that they eat, but I went with this one – you can’t resist some puff pastry can you? In England it would be more traditional to have a fruit cake on this day, but to be honest over the last few weeks I have eaten so much Christmas cake, I can’t face any more! Heat the oven to 200C/fanC180/gas 6. Divide the ready-made puff pastry in half, roll out each piece and cut into a 25cm round. Put one round on a baking sheet and spread with the apricot jam to within 2cm of the edges. Beat together the softened butter and caster sugar until light and fluffy, then beat in the egg. Stir in the ground almonds and cognac or dark rum. Spoon the mixture over the jam, spreading it evenly. Brush the edges of the pastry with water, then cover with the second piece, pressing the edges to seal. Mark the top of the pastry from the centre to the edges like the spokes of a wheel or in a zig zag pattern, then brush with beaten egg. Bake for 25-30 mins until crisp and golden. Serve warm or cold. However, tasty all the same. Also, since something hot and spicy is also traditionally consumed on this day… I might wash it down with a cinnamon hot chocolate or something stronger!